Web application frameworks are made to help developers build web applications. Some of them also help you with securing the web application. In fact one framework is not more secure than another: If you use it correctly, you will be able to build secure apps with many frameworks. Ruby on Rails has some clever helper methods, for example against SQL injection, so that this is hardly a problem. It's nice to see that all of the Rails applications I audited had a good level of security. The Gartner Group however estimates that 75% of attacks are at the web application layer, and found out "that out of 300 audited sites, 97% are vulnerable to attack". This is because web applications are relatively easy to attack, as they are simple to understand and manipulate, even by the lay person. In order to develop secure web applications you have to keep up to date on all layers and know your enemies. To keep up to date subscribe to security mailing lists, read security blogs and make updating and security checks a habit (check the Additional Resources chapter). I do it manually because that's how you find the nasty logical security problems. The session id is a 32 byte long MD5 hash value. A session id consists of the hash value of a random string. The random string is the current time, a random number between 0 and 1, the process id number of the Ruby interpreter (also basically a random number) and a constant string. Currently it is not feasible to brute-force Rails' session ids. To date MD5 is uncompromised, but there have been collisions, so it is theoretically possible to create another input text with the same hash value. But this has had no security impact to date. Cookies imply a strict size limit of 4kB. This is fine as you should not store large amounts of data in a session anyway, as described before. 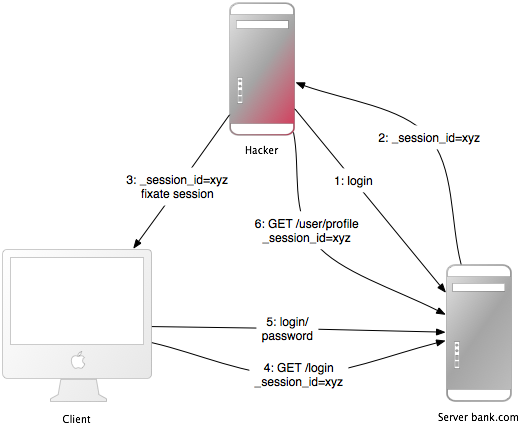 Storing the current user's database id in a session is usually ok. The client can see everything you store in a session, because it is stored in clear-text (actually Base64-encoded, so not encrypted). So, of course, you don't want to store any secrets here. To prevent session hash tampering, a digest is calculated from the session with a server-side secret and inserted into the end of the cookie. That means the security of this storage depends on this secret (and on the digest algorithm, which defaults to SHA1, for compatibility). So don't use a trivial secret, i.e. a word from a dictionary, or one which is shorter than 30 characters. Their new, lower credit will be stored in the session. The dark side of the user forces them to take the cookie from the first step (which they copied) and replace the current cookie in the browser. The user has their credit back. They possibly maintains the session. Expiring sessions, for example every 20 minutes, greatly reduces the time-frame for attack. Therefore they access the web application from time to time in order to keep the session alive. Bob browses a message board and views a post from a hacker where there is a crafted HTML image element. The element references a command in Bob's project management application, rather than an image file. CSRF appears very rarely in CVE (Common Vulnerabilities and Exposures) - less than 0.1% in 2006 - but it really is a 'sleeping giant' [Grossman]. This is in stark contrast to the results in my (and others) security contract work - CSRF is an important security issue. If your web application is RESTful, you might be used to additional HTTP verbs, such as PATCH, PUT or DELETE. Most of today's web browsers, however do not support them - only GET and POST. Rails uses a hidden _method field to handle this barrier. POST requests can be sent automatically, too. Here is an example for a link which displays www.harmless.com as destination in the browser's status bar. In fact it dynamically creates a new form that sends a POST request. This will automatically include a security token in all forms and Ajax requests generated by Rails. If the security token doesn't match what was expected, the session will be reset. sign_out_user # Example method that will destroy the user cookies. The above method can be placed in the ApplicationController and will be called when a CSRF token is not present on a non-GET request. If your Apache DocumentRoot points to Rails' /public directory, do not put file uploads in it, store files at least one level downwards. A real-world example is a router reconfiguration by CSRF. The attackers sent a malicious e-mail, with CSRF in it, to Mexican users. The e-mail claimed there was an e-card waiting for them, but it also contained an image tag that resulted in a HTTP-GET request to reconfigure the user's router (which is a popular model in Mexico). The request changed the DNS-settings so that requests to a Mexico-based banking site would be mapped to the attacker's site. Everyone who accessed the banking site through that router saw the attacker's fake web site and had their credentials stolen. Another example changed Google Adsense's e-mail address and password by. If the victim was logged into Google Adsense, the administration interface for Google advertisements campaigns, an attacker could change their credentials. And thus it found the first user in the database, returned it and logged them in. You can find out more about it in my blog post. It is advisable to update your plug-ins from time to time. Moreover, you can review your application to find more flaws like this. Depending on your web application, there may be more ways to hijack the user's account. In many cases CSRF and XSS will help to do so. For example, as in a CSRF vulnerability in Google Mail. 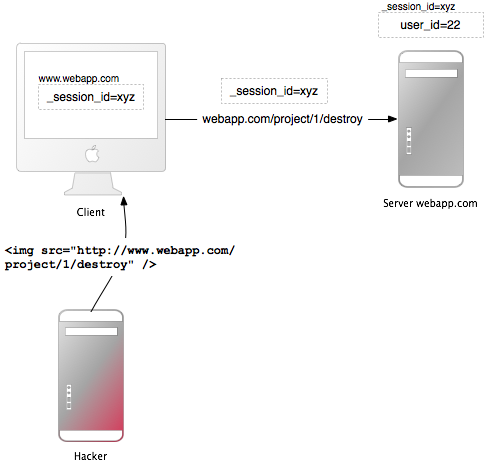 In this proof-of-concept attack, the victim would have been lured to a web site controlled by the attacker. On that site is a crafted IMG-tag which results in a HTTP GET request that changes the filter settings of Google Mail. If the victim was logged in to Google Mail, the attacker would change the filters to forward all e-mails to their e-mail address. This is nearly as harmful as hijacking the entire account. As a countermeasure, review your application logic and eliminate all XSS and CSRF vulnerabilities. A CAPTCHA is a challenge-response test to determine that the response is not generated by a computer. It is often used to protect comment forms from automatic spam bots by asking the user to type the letters of a distorted image. The idea of a negative CAPTCHA is not for a user to prove that they are human, but reveal that a robot is a robot. You will get two keys from the API, a public and a private key, which you have to put into your Rails environment. After that you can use the recaptcha_tags method in the view, and the verify_recaptcha method in the controller. Verify_recaptcha will return false if the validation fails. The problem with CAPTCHAs is, they are annoying. Additionally, some visually impaired users have found certain kinds of distorted CAPTCHAs difficult to read. The idea of negative CAPTCHAs is not to ask a user to proof that they are human, but reveal that a spam robot is a bot. Use before_action only: [...] instead of except: [...]. This way you don't forget to turn it off for newly added actions. The most common entry points are message posts, user comments, and guest books, but project titles, document names and search result pages have also been vulnerable - just about everywhere where the user can input data. But the input does not necessarily have to come from input boxes on web sites, it can be in any URL parameter - obvious, hidden or internal. Remember that the user may intercept any traffic. Applications, such as the Live HTTP Headers Firefox plugin, or client-site proxies make it easy to change requests. As a second step, it is good practice to escape all output of the application, especially when re-displaying user input, which hasn't been input-filtered (as in the search form example earlier on). Use escapeHTML() (or its alias h()) method to replace the HTML input characters &, ", <, > by their uninterpreted representations in HTML (&amp;, &quot;, &lt;, and &gt;). However, it can easily happen that the programmer forgets to use it, so it is recommended to use the SafeErb plugin. SafeErb reminds you to escape strings from external sources. Another problem for the worm's author were CSRF security tokens. Without them he couldn't send a friend request over POST. He got around it by sending a GET to the page right before adding a user and parsing the result for the CSRF token. This example, again, showed that a blacklist filter is never complete. However, as custom CSS in web applications is a quite rare feature, I am not aware of a whitelist CSS filter. If you want to allow custom colors or images, you can allow the user to choose them and build the CSS in the web application. Use Rails' sanitize() method as a model for a whitelist CSS filter, if you really need one. When params[:token] is one of: , [nil], [nil, nil, ...] or ['foo', nil] it will bypass the test for nil, but IS NULL or IN ('foo', NULL) where clauses still will be added to the SQL query. X-Frame-Options 'SAMEORIGIN' in Rails by default - allow framing on same domain. Set it to 'DENY' to deny framing at all or 'ALLOWALL' if you want to allow framing for all website. X-Content-Type-Options 'nosniff' in Rails by default - stops the browser from guessing the MIME type of a file. Access-Control-Allow-Origin Used to control which sites are allowed to bypass same origin policies and send cross-origin requests. It is beyond the scope of this guide to inform you on how to secure your application code and environments. However, please secure your database configuration, e.g. config/database.yml, and your server-side secret, e.g. stored in config/initializers/secret_token.rb. You may want to further restrict access, using environment-specific versions of these files and any others that may contain sensitive information.